Posted: Sat Apr 28, 2018 11:59 am Post subject: Anubis - no temples? In this article it says that he doesn`t have temples dedicated to him. Is it true? I`m writing a short story so I hope to get some confirmation. At Abydos there is a temple to Khenti Amentiu. This is the name by which Anubis may have originally been known, but it may also be an epithet for Osiris. 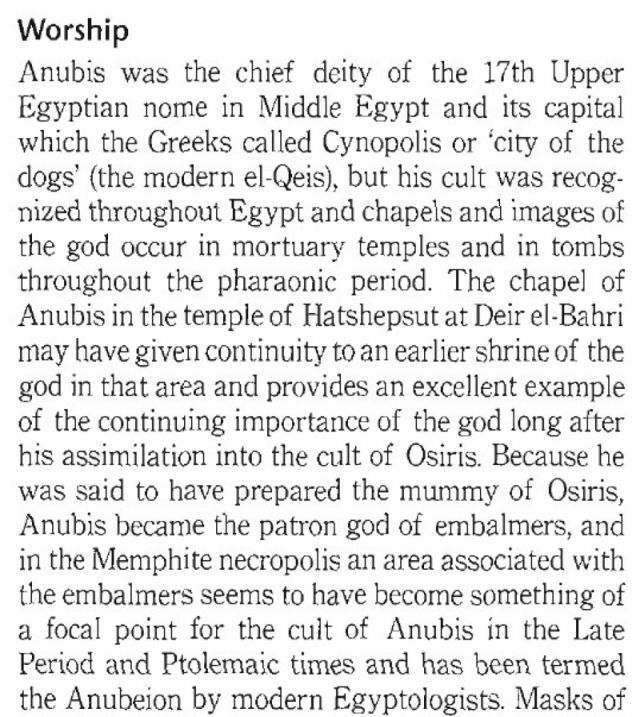 Like so much of their religion, it's "complicated", but this temple does seem, or seemed to, have had the function of being a temple for Anubis, at least in it's early years before being taken over by Osiris. I guess it depends on if anybody sees Anubis as having three names, not counting epithets, Anubis, Khenti Amentiu and Wepwawet, with Horus and Osiris in the mix. Christina Antoniadou : Anubis - Τhe God’s Manifestation in the Iconographical and Literary Sources of the Pharaonic Period. - [Rhodes, University of the Aegean, 2018]. - 154 p.
The subject of this work is the manifestations of the god Anubis through the iconography and literary of the pharaonic period (3000 - 31 BCE). The reason I chose this topic is that the canid-headed god always fascinated me and drove my imagination, and as a postgraduate student, I wanted to know and explore his story. Although there are many gaps in the origin of the god, the only certainty is that it comes from the long-term observation of the nocturnal / carnivorous animals, a subject that we will discuss in Chapter 1. In this chapter, we will mention, the other canid-headed gods of the Egyptian pantheon, like Wepwawet, Duamutef etc. In addition, we will introduce Anubis and his history from the Old Kingdom to the Ptolemaic Period. Therupon, through the iconography, we will state the human relations with the canidae family during the Predynastic Period and how this relationship was a precursor to the Anubis’s cult. Furthermore, we will report the variety of Anubis manifestations associated with the funerary and rebirth contexts (the judgement of the dead, mummification etc), as also his postures and gestures (recumbent, standing, enthroned etc. ), and make an attempt to interpret them. Subsequently, we will try to decipher the roles of Anubis from the literary (PT, CT, BD etc.). From the many epithets that are attached to Anubis, we will choose the most characteristic for their interpretation, which is part of god's role in the Egyptian world (like “he who in the place of embalming”, “lord of the sacerd land”). Afterwards, we will mention the priesthood and we will cite verses from the Egyptian literary that include them in the religious context of Anubis. In the process the temples and shrines dedicated to the god will be mentioned, as well as the cemeteries associated with the canidae family. At the same time, before drawing conclusions, we will present the various instruments used in rituals, such as the “Opening of the Mouth”, as well as the festivals in honor of the god. The bibliography on Anubis is not great, but many books generally refer to him, but do not specialize in the study of the god, except maybe the research of Terence Duquesne. Many of them mention the same details or little more about the god. We tried not to concentrate on the general facts that are known, apart from a small reference to them, and we emphasized in the categorization and interpretation of his iconography giving examples through the findings of Pharaonic art. We avoided talking about those subjects that we did not have an elementary bibliography. The publication that was used for the PT was that of Allen and for CT was that of Faulkner. The photographs of this thesis are from books, archaeological magazines, museums and distinct sites, such as Osirisnet. It is said in the Egyptian Book of the Dead, by Raymond O'Faulkner, that Abydos was sacred to Anubis. Anubis was the protector of Osiris and the underworld, in the embalming process. Abydos is the place said to have been where Osiris was entombed. It is interesting to note that it is still a bit buried to this day, the majority of the structure still being under the Earth.